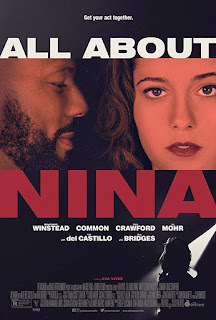 Read Will's review of All About Nina. Nina Geld (Mary Elizabeth Winstead) is an up-and-coming comedian in New York City. She’s funny, smart and has worked hard to build a career for herself in the male-dominated world of stand-up. But when it comes to romantic relationships, Nina’s life is a mess. Random guys in bars, abusive married men (Chace Crawford), and an inability to stand up for herself finally convince Nina it’s time for a change. She packs up and moves to Los Angeles, for a once in a lifetime opportunity to audition for Comedy Prime — the end all, be all of late night comedy. After killing it in Los Angeles, she meets chill contractor Rafe Hines (Common), who tempts the brash New Yorker into considering commitment. Sublimating her own desire to self-destruct, Nina has to answer the question, once and for all, of whether women can indeed have it all. 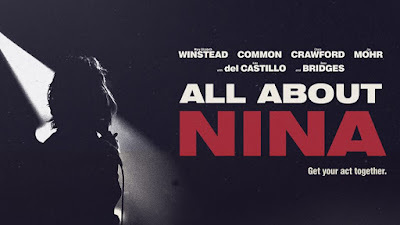 All About Nina is in select theaters on October 12th, 2018. Mary Elizabeth Winstead plays a stand-up comedian in New York City named Nina who is trying to become an up-and-coming star in the comedy circuit. She has a raunchy routine with a dark sense of humor but an even darker past. As her personal life is falling apart, she moves to L.A. for a chance to audition for a big comedy special. After her first gig in L.A., she meets Rafe, played by Common, and tries to get a date out of her. The two hit it off and slowly build a meaningful relationship. I went into this film blind without seeing a single trailer but the premise I read seemed intriguing. There's a lot of good, funny comedy between the different stand-up sets and Nina's life, and also has time to be serious. Throughout the movie, we see Nina as this strong independent women, finding what it is like to be in an actual relationship with someone she cares about. It's about learning to speak the truth instead of hiding behind your lies (which is also the theme in a recent animated film). This is Winstead’s best role in her career by far. Her chemistry with Common was wonderful and very believable. There is a moment near the end with Nina that will be worth the price of admission alone. This is also a great directorial debut for Eva Vives, I can’t wait to see more of her in the future. This movie is raw, funny, and emotionally satisfying. It's an interesting look into the life of a female comic, the struggles and the triumphs. A good combination of comedy and female empowerment and I highly recommend it to everyone.